This is an ideal instrument for noise monitoring in factory, school, business and traffic areas. 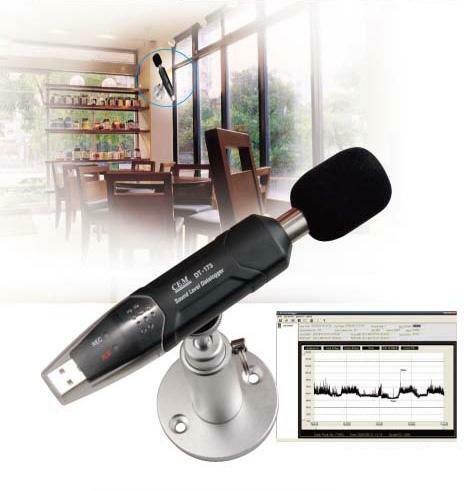 This is a brand new CEM DT-173 CE certified digital sound / noise level datalogger. This meter has a built-in USB port which connects to a Windows PC for uploading the recorded data. This is an ideal instrument for noise monitoring in factory, school, business and traffic areas. This meter conforms to the IEC61672-1 Class 2 standards. This device operates on a 3.6V Lithium battery. This device is very accurate (+/- 1.4 dB) and durable, an ideal companion for your field projects. Please note that the FREE Windows software is provided AS IS. There is no software development kit nor engineering support for the software.